Everyone would love to have a collection of perfect, shiny coins in their binder. Because we're working with circulated coins, however, we're going to end up with scratched, dirty, or otherwise imperfect specimens. You may find coins that have actual dirt/grime on them, have been written on, or have tarnish or blemishes from being handled by the dozens of people whose pockets the coin went through before coming into your possession. Like all collectibles, cleaning anything that may potentially be valuable is best left to professionals. Cleaning to preserve value and avoid further damage takes great care and an understanding of the type of metal in the coin and the type of stain/blemish/coating that is affecting it. If you have coins that you would like to get professionally cleaned, talk to a local coin shop and see if they offer cleaning services or can recommend a local, respectable cleaning service (they may have one they use for the coins in their shop). You could write a book on all the different ways to clean different types of coin problems. I'm going to cover a couple of different cleaning methods I've used, but they are by no means the only ways to deal with dirty coins. Do not use any of these cleaning methods on valuable coins, or coins made of silver or gold! For a mild cleansing to remove loose dirt and surface oil, you can start with simple soap and water. Fill a bowl with water, add a squirt of liquid hand soap and mix it together. Take one or two handfuls of coins and swish them around in the bowl for about a minute. 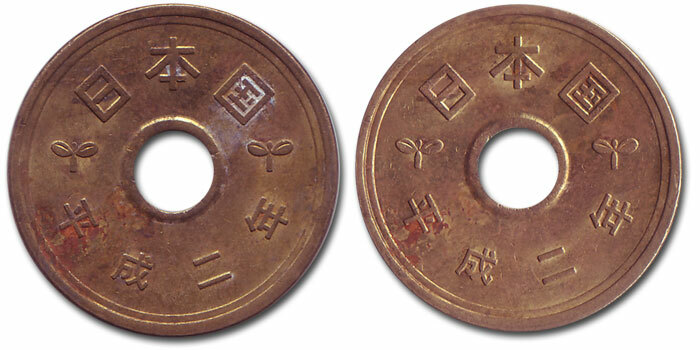 Take them out, rinse them with plain water, and immediately dry them with a towel - if any water drops are left to dry on the coins themselves, they could create new stains. Repeat with the rest of your coins. If there is stuck-on dirt or grime, you can try to scrape it off with a pencil eraser or toothpick. You don't want to use anything that's harder than the metal you're cleaning, or you could cause new scratches. Toothpicks are especially handy for clearing dirt out of corners, letters, or other small designs in a coin. To give a coin more of a scrub/polish, you can try rubbing the coin with toothpaste. You can either use a soft-bristled brush (not the brush you use yourself) or apply toothpaste to a washcloth, and gently rub/scrub the coin on both sides. Most toothpastes include a mild abrasive, which on the coin will scrub away the outer-most layer of metal and reduce the appearance of stains or tarnish. Rinse the coin well with water when you're done, and then immediately dry it. Some tarnish, oil, and dirt can be removed by soaking the coin in an acidic liquid like vinegar. Put some vinegar in a glass container and drop the coin in. Let it lay for 5 minutes on one side, then flip it over so that the other side gets exposure to the liquid and soak for 5 more minutes. Remove it, rinse well with water, and then dry. There are many different cleaning solutions that you can buy online or from a coin shop that are designed for cleaning coins. Ask your coin shop for a product that they recommend, or do some searches online to see what other coin collectors like or don't like. Once you've cleaned your coins, you need to handle them as little as possible to keep them clean. Hold cleaned coins only by the edges so that your fingers don't touch the front or back. You can use soft cotton gloves to handle coins once they've been cleaned (and it's not a bad idea to use them anytime you handle coins) to avoid transferring finger oil onto the coins. Seal your coins in paper or plastic flips so that they won't be exposed to more fingerprints or dust, and then store them in your chosen container (see my earlier post about starting a coin collection for more information about flips, albums, and boxes). Unless you are preparing coins for a gift or display, I feel that you're usually better off not cleaning your coins. The benefit you get from cleaning is very small, and you run the risk of reducing whatever value the coin might have. There is no doubt that a good cleaning can make a coin look significantly better, but authenticity often trumps appearance for collectibles - leaving your coins unaltered is usually the safest choice.